Thank you for the support you have given us with payment of subscriptions. It is rewarding for our committee to know your support. We realise how easy it is to let matters slip and if you have still to update your membership we look forward to receiving your subscription. Some members have had a problem with the on line membership form. Where this has happened and we have been notified our web master, Mike Forret, has contacted the member having trouble and has tweaked the programme to eliminate the difficulty. Lake Taupo Zone Committee of Waikato Regional Council. Brian Richmond of Waikato Regional Council, addressed the committee on the issues arising for WRC in creating policy from The National Policy Statement for Freshwater Management which directs Regional Councils to develop Freshwater Management policy within their council area. In a nutshell, the Freshwater NPS directs regional councils, in consultation with their communities, to set objectives for the state of fresh water bodies in their regions and to set limits on resource use to meet these objectives. involve iwi and hapū in decision-making and management of fresh water. It was a most interesting discussion. I chatted with my neighbour, a developer, about the matters raised and he explained that developers were already having to comply with new regulations as within the urban area the starting point is that there should be no more run off from the development than was the case before development and building. The interest for me was in the ways that this could be achieved. The Taupo Zone Committee will host a meeting on either 26th or 27th March to discuss the WRC policy being developed. 1 Billion Trees. The opportunity is to get native trees for this initiative. Paul Green of Project Tongariro advised that the Native tree nurseries are having difficulty meeting demand. He also advised that any application had to have funds to develop the area ready for planting, before getting the trees. I am still pushing to have an ICMP developed in my time on this committee. I have researched our Annual Reports and Newsletters (all on our website) and am reminded that The Virginia Church petition to the Parliamentary Select Committee for Local Government and the Environment, was heard on 17.2.2002. The outcome was that Environment Waikato (EW) would take responsibility and that a regular meeting between stakeholders and EW woud be held. Consequently The Tongariro River Management Forum was initiated by EW and the first meeting was held 11.2.2002. A management plan was developed in 2006 but stakeholders and Iwi said that it did not meet their requirements. Annual plans have been produced and much has been done but the overall plan has still to be made. The idea of an ICMP was adopted by the Forum committee and by the Taupo Zone committee. The Forum later folded. No ICMP has to date been produced. Further to our conversation in passing last week what I wanted to raise with you was the need for view shafts to be cut at various places along the river. I walk the river a lot (and cycle occasionally). We have a wonderful asset in our river but the reality is that planting and ‘natural’ regrowth – means we are very rapidly losing the opportunity to enjoy any sight of the river unless we leave the track (I’m talking SH1 bridge to Red Hut Bridge). Tracks down to the river – even if that were a sensible alternative are not suitable for the older age group and certainly not for cyclists. Runners and cyclists are not likely to make a special detour just to glimpse the river. I have been particularly disappointed to lose sight of the river (except in a very few rapidly disappearing spots) on the true right overlooking the Judges Pool area and beyond. Regrowth after the clearance of a few years ago has been particularly rapid on the hill over the last year. It is mostly scrub and wilding pine although the problem is no different, for example, on the true left between Kutai and Koura Streets where deliberate planting took place some years ago. Up river, ever since the trail extension up above the Never Fail Pool took place I have been concerned at how little of the river you can see from what should be a series of great vantage points. Many times I have been tempted to take a slasher up there with me but I suspect it has become more a question of chainsaws! The Advocates were responsible for clearing the river bank and planting. We were to replant with low growing native vegetation. Unfortunately the vegetation is low growing compared with mature trees but not low enough to afford those using the Tongariro River Trail to see the river. This was forseen by local resident Bruce Wilde who was incensed with the planting and expressed his concern in a page advertisement in the local paper. The fact is that plants are needed to hold the river bank in times of flood. I think that Graeme’s suggestion has merit. We have received other requests to open up viewing of the river. We don’t have any ownership of the river bed or the banks alongside the river bed and must consult with the landowners before we can do anything. The landowner can set the requirements for any work done. The trophy fishery of Lake Otamangakau is showing stress this hot summer. It is a shallow lake and with the intense heat at the peak of summer fish have been stressed. Being a trophy fishery it is a popular opportunity to catch large trout in excess of 10lbs. The fish at this time are stressed by the warmer water. When caught anglers like to take a photo holding their trophy fish. 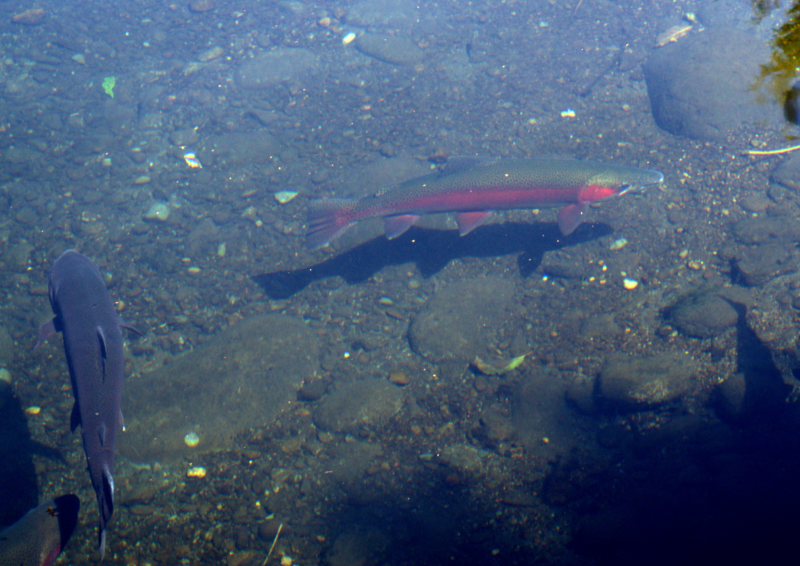 Often the fish is then returned to the water and swims away. But being caught and handled often incorrectly is additional stress that is too much for the fish which then dies. The evidence of this is the sight of big dead fish. This is covered in the fine Taupo Fishery Facebook page that replaced the hardcopy Target Taupo which is emailed to those anglers who pay on line for their annual fishing license. None the less I intend to connect it to our Facebook page which has been unused for some time. I have enjoyed visiting the National Trout Centre and viewing the 9 or 10 Whio there. They are soon to be release to the upper waters of the Manganuiateao between National Park and Raetihi. 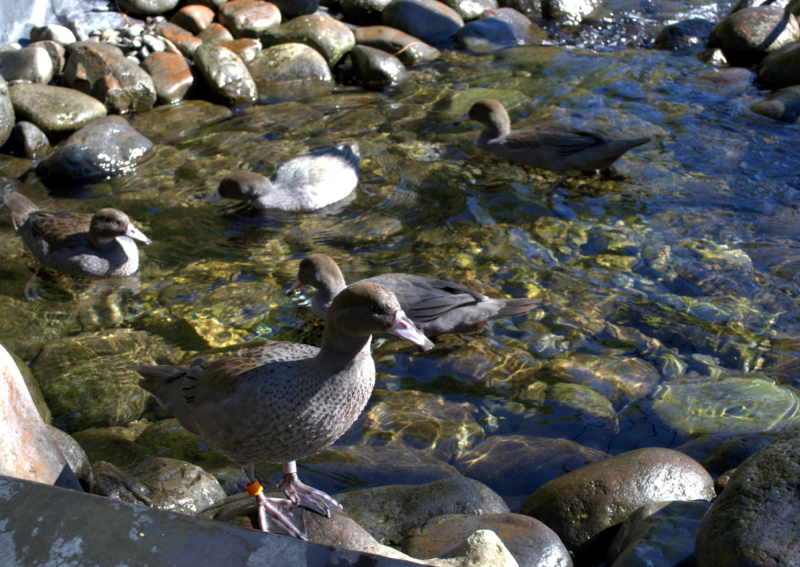 On the Tongariro River there are increasing numbers of Whio as a consequence of special efforts by DOC and funding from Genesis. I also enjoy watching the trout from the bridge over the Waihukahuka Stream on the walk from the car park to the Trout Centre.